Apple CEO Tim Cook spoke at the All Things D Conference today in Rancho Palos Verdes, California. A variety of issues were covered, but one of the major components was discussion of the Apple TV. Cook said that Apple was on track to double sales of the Apple TV this year and had sold some 2.7M so far, with only 2.8M sold all year last year. Cook said that staying in the Apple TV market was uncharacteristic for Apple. ” We’re not a hobby kind of company as you know. Our tendency is to do very few things. And, if something creeps in and isn’t a big success, we get it out of the way and put our energies on something else. Cook said that the Apple TV was an ‘area of intense interest’ for the company. 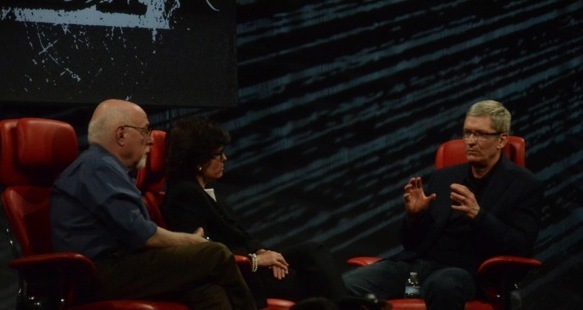 When outright queried by moderator Walt Mossberg whether Apple was going to make a TV product, Cook said that he would not answer the question. Cook said that Apple had a level of trust with content creators in Hollywood, and that he has had meetings with them recently to see what more they can do together, but said that Apple itself does not need to own a content business. This is in contrast to other streaming services like YouTube or Netflix, which are experimenting with creating their own programming.